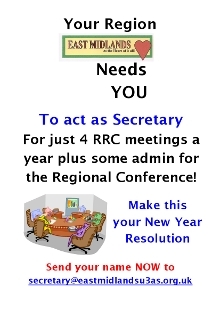 Your region needs you to act as Secretary for just four RRC meetings a year plus some administration for the Regional Conference. Make this your New Year Resolution, send your name NOW to: secretary@eastmidlandsu3as.org.uk. To view and /or print the poster click here. The Regional Trustee has written a letter to all Chairmen of East Midlands U3As to give them an update on things that are happening at National and Regional levels in the U3A movement. At the Regional level questions are sometimes asked about where our moneys come from and how they are spent, and the letter includes an appendix that sets this out clearly. The letter is in the Publications section. The date for the 2015 Annual Conference and AGM is Wednesday 29th July 2015, with the theme 'To Sleep Perchance to Remember' exploring the links between sleep, memory and ageing. More information in the Events section. The Regional Trustee will be producing information leaflets answering questions asked in meetings across the region. The first of these publications is Guidelines for Debit and Credit Cards, now in the Publications section. Also added to the Publications section is the latest information on the role of Regional Trustee including recent items of interest. Nottingham Trent University are exploring the possibility of developing a University – level course in the Social Sciences, specifically for older people, building on successful examples of such courses elsewhere in Europe. The course is being designed for people aged 55 – 75. To help with the planning they want people to complete questionnaires and participate in focus groups. Details in this leaflet. U3A Family History Conference - Another Outstanding Success. On Saturday 13th September 2014, 230 delegates travelled to the beautiful Dome building in Buxton for this event and were treated to a very professional mix of lectures on all forms and histories of genealogy. More information in this report. The East Midlands Regional Conference and AGM was held at Trent College, Long Eaton, Nottingham on Tuesday 15 July 2014. Photographs taken at the event can be viewed in the Events Section. A Conference Feedback Analysis is now available with other conference documents in the Publications Section. Leicestershire and Rutland Network present U3A at Snibston Mining Museum, Friday 10th October 10am to 5pm, be entertained, illuminated and stimulated by a full day with something for everyone, tickets £10.50 including afternoon tea. Full details in the Events Section. Radcliffe U3A are holding a WW1 exhibition at the Royal British Legion, Main Road, Radcliffe on Trent from August 2nd to 10th. Open on the 2nd from 2 to 6pm and all other days from 10.30am to 6.00pm . Come along and see. For full details go to www.radcliffeontrentww1.org.uk. Do we forget a third of our lives? Does sleep help us remember? A workshop designed to introduce you to the Sleep Memory project, in which the East Midlands Region is collaborating with the University of Lincoln, will be held on Friday 3rd October 2014 in the Grantham Guildhall pavillion. Details in the Events Section. The East Midlands Regional Conference and AGM is to be held at Trent College, Long Eaton NG10 4AD on Tuesday 15 July 2014. The theme is - PARTICIPATION “It’s all about taking part!”. The conference programme is available in the Events Section. Regional Memory Newsletter Issue 4 is now available in the Publications Section, and there is to be another Regional Memory Course Seminar on Friday 03 October 2014, with more details to follow. Lynne Cox. How old is your Constitution? Would it pass scrutiny today by the Charity Commission? What should all Committee members know and understand? 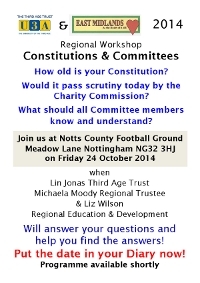 Join us at Notts County Football Ground, Meadow Lane, Nottingham NG32 3HJ on Friday 24 October 2014 when Lin Jonas Third Age Trust, Michaela Moody Regional Trustee, and Liz Wilson Regional Education and Development will answer your questions and help you find the answers! Put the date in your Diary now! Programme available shortly. See the enlarged poster in the Events section.